SPINACH, MUSHROOM AND BACON SALAD ...a nice spinach salad recipe for parties. A great one ! 1 bag (10 oz.) spinach, or 3/4 lb. In a small bowl with fork or wire whisk, mix oil, vinegar, sugar, mustard, salt and pepper. In a 10-inch skillet over medium heat, cook bacon until crisp. Drain on paper towels; crumble and set aside. In a large salad bowl, tear spinach into bite-sized pieces and add mushrooms. Pour dressing over and toss gently. Sprinkle with bacon and chopped eggs. 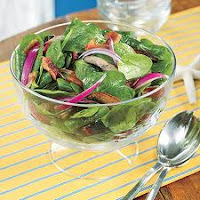 This nice spinach salad recipe is ready to serve ....immediately... for 6 persons. Great taste ! Enjoy it !